Selejio, Onesmo, Razack Lokina and John Mduma. 2018. “Smallholder Agricultural Production Efficiency of Adopters and Nonadopters of Land Conservation Technologies in Tanzania.” Environment & Development 0: 1-27. Promotion and supporting the adoption of land management and conservation technologies (LMCTs) among poor farming households has been considered to improve crop yields as well as production technical efficiency (TE). 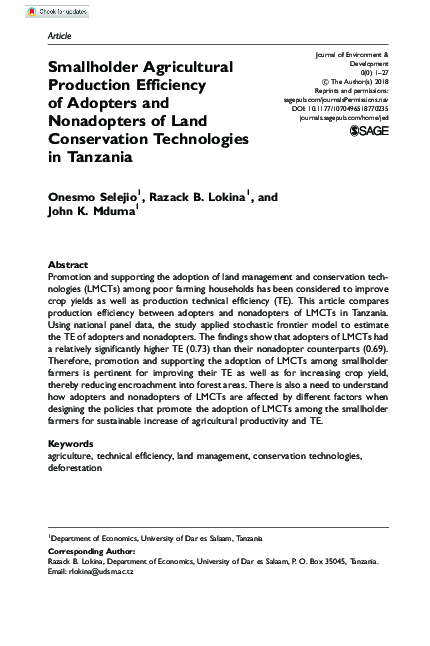 This article compares production efficiency between adopters and nonadopters of LMCTs in Tanzania. Using national panel data, the study applied stochastic frontier model to estimate the TE of adopters and nonadopters. The findings show that adopters of LMCTs had a relatively significantly higher TE (0.73) than their nonadopter counterparts (0.69). Therefore, promotion and supporting the adoption of LMCTs among smallholder farmers is pertinent for improving their TE as well as for increasing crop yield, thereby reducing encroachment into forest areas. There is also a need to understand how adopters and nonadopters of LMCTs are affected by different factors when designing the policies that promote the adoption of LMCTs among the smallholder farmers for sustainable increase of agricultural productivity and TE.